Currently reading: I’m still making my way through Dreams of Joy by Lisa See and I’m hoping I’ll have it finished by next week. I need to start running more which means more time to enjoy this book! I decided to take The Joy Luck Club by Amy Tan with me on vacation and read a paper copy before bed at night. I didn’t quite finish it but it’s my main focus now in print. I think this will easily be finished next week. I started Bel Canto by Ann Patchett as an ebook while I was on vacation but the hold came due and I stopped about halfway through. I’m anxious to pick it up again but I’ll probably wait until the ebook is available rather than find it in another format. When I lost Bel Canto, I picked up The World We Found by Thrity Umrigar. I’m not far into it at all but I’m hoping to make some steady progress. I’m not sure when, though. My ebook reading will likely drop off now that I’m back from vacation. Recently finished: I finished two! First was The Post-Birthday World by Lionel Shriver which I finished while I was in Spain. I really loved this one and enjoyed the plot structure more than I anticipated. It was a great one to pick up when I was traveling and I’m looking forward to writing a review to post tomorrow. I’m giving it Four out of Five Stars. I finally finished The Feminine Mystique by Betty Friedan! I got home from vacation and decided to plop myself in the armchair until it was finished. It’s one I’m glad I’ve read but that I’ll never touch or be tempted by again. I’ll have a full review for next week but let’s just say it wasn’t pretty. I gave the book Two out of Five Stars. Reading Next: My book club is meeting at the end of the month so I’ll next pick up Ordinary Grace by William Kent Krueger. I don’t know anything about this one but grabbed a used copy at a fundraiser. We’ll see how it goes! ← How Does Your Writers Group Work? I havent heard of these, but i look forward to your reviews! Thanks! It will feel good to finish some things and write them! Happy reading. I hope you can find something new to enjoy. Happy reading! We Need to Talk About Kevin was my favorite of the two I’ve read. Happy reading! I’ve not read any of your mentioned books but I wish you happy reading! Thanks, it feels good to have wrapped them up! Happy reading. I’m lucky to have a few great authors going now. Happy reading! Same! I think I can finish it this weekend. Happy reading! I hope to do the same to, but it’s gonna be a busy weekend! Happy reading! It will be a bit hard to write with how long it took me to read. Happy reading! Well done for finishing the Feminine Mystique. I’ve read a few books like that, I’m happy to have read but never want to go anywhere near again. So true! It felt great to return it to the library. Happy reading! I’m excited to open it soon. Happy reading! I linked up this week. Thank you for hosting! Thanks for joining. Happy Wednesday! I think you included a link to your editing page instead of the public link. Welcome! Glad to have you. Happy Wednesday! Those are some interesting titles — I look forward to checking some of them out. This is the first time I am linking up: https://hareadsbooks.wordpress.com/2018/08/08/www-wednesday-reading-updates/. I hope you find something new. Happy Wednesday! Ah, The Joy Luck Club! As with The Feminine Mystique, I wonder what draws you to older books that are no longer on everyone’s radar? I’ve got two biographies — one about entertainment, the other from the world of sports. The Feminine Mystique was a book club pick and I wouldn’t have read it otherwise haha. I’ve been wanting to read something by Amy Tan and The Joy Luck Club is an obvious pick. I found a copy at a used book sale that I’m working through now. Happy reading! So glad you are back and…Wow, I can’t believe you finished Betty Friedan. Kudos to you! Here is my WWW: https://silverbuttonbooks.com/2018/08/08/www-wednesday-august-8-2018/ Have a great week! Thank you! It took some discipline as my husband caught me on my phone while I was trying to finish haha. Happy reading! I don’t blame you one little bit. I read it before phones and stared at the wall. It was a hard one for me. I’m excited to share later this month. It was a great time. Happy reading! I hope you’re enjoying all of your books. Here’s my WWW! Happy reading! I’m excited to start it. Happy reading! I quite enjoyed The Feminine Mystique but then again it was one of the lesser boring set texts that I had to read! I probably wouldn’t read it for pleasure! 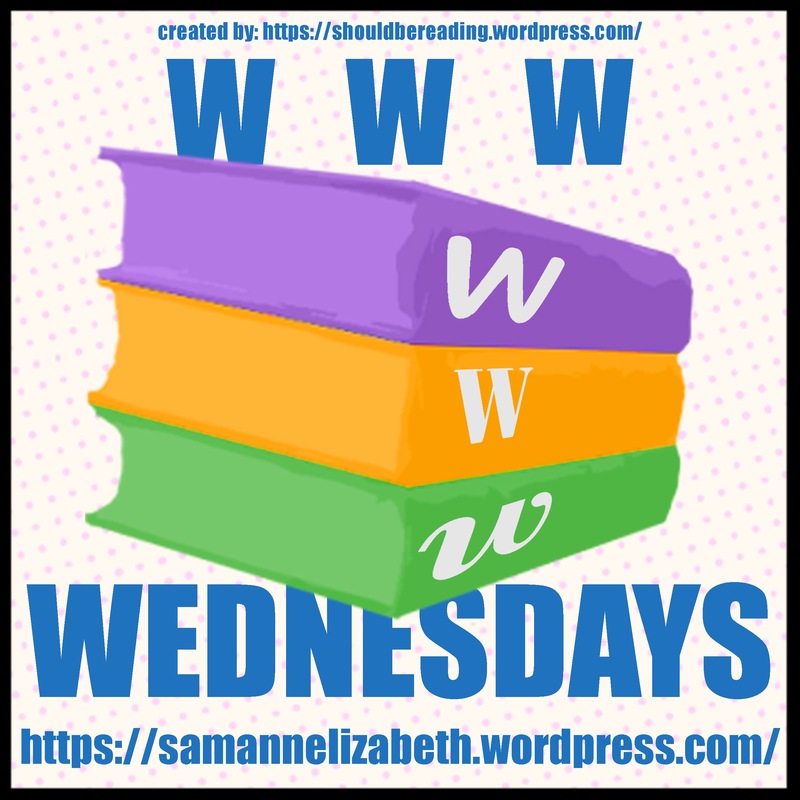 Here is my first ever WWW wednesday https://bethsbookishbackpacking.wordpress.com/2018/08/08/www-wednesday/ hopefully I can make this more of a regular thing as it is really fun! I think it would have been better if I read it for school. It would have had more context at least! Happy Wednesday! Reading next: Gentlemen Prefer Blondes by Anita Loos – I’ve had a pretty pink, clothbound version on my shelf for about 2 years and I think it’s time to read it! Traveling where?! Sounds like you have done good reads to take with you. Happy reading! How fun! I hope you have an amazing trip. Sounds like quite a surprise. Happy reading! I want to read The Joy Luck Club. Ordinary Grace looks good, too. Joy Luck is a lot of short stories connected to each other. I’m liking it a lot. Happy reading! It’s about time haha. Happy reading! I haven’t read any of these, but I’m pretty sure I’ve seen bits and pieces of the film adaptation to Joy Luck Club, haha. The Feminine Mystique is one that I’m curious about, but not enough to actually pick it up. Great list. I hope to watch the Joy Luck Club movie as soon as I finish the book. I wasn’t a fan of The Feminine Mystique, I’ll be writing up a review in the next week or so. Happy reading! That’s awesome that you were able to get some reading done on your vacation! Thanks, I feel very accomplished! Happy reading. Hope you had a great vaca!! Thanks, it was wonderful. Happy reading! It was incredible and I’ll post about it later this month. Happy reading! Ordinary Grace sounds interesting! I hope you will enjoy your books this week and happy reading. Here’s my WWW. Thanks! I’m really looking forward to starting that one. Happy reading! Haha always happy to fill it up. Happy reading! I’ve just had a look at some of these books on Goodreads, Ordinary Grace sounds very interesting. I’m excited to start that one soon. Happy Wednesday! Glad you were able to finish some while on vacation! Thank you! I was glad to knock some out, too. Happy reading! These are all new to me. I hope you’re enjoying your current reads. Happy Wednesday! Welcome back! I hope you had a great trip! Congrats on finishing two books and I’m looking forward to reading your thoughts on The Feminine Mystique. I’ll be writing them up soon and posting early next week. Happy reading! You just expanded my TBR list exponentially! Lol. I enjoy reading this post each week—wouldn’t miss it! I’m so glad! It’s so fun to explore new reads. Happy reading!